Best apartment in Temple for the pricesubmitted by Dara W. - Sep 29, 2015 |Recommended: YesIt is a really nice community to live in. Maintenance is FAST and office staff is wonderful. I used to hear my neighbor's music occasionally, but they moved so it is no longer a problem, and it was never loud enough to complain. I have a non-updated unit that is not the highest quality, but I couldn't ask for better for the price I pay. I have friends in other apartments who pay more but are not near as satisfied with their apartments. Love living here submitted by Jaclyn W. - Sep 03, 2015 |Recommended: YesNice community. Love all the trees. The staff is super nice and helpful. Maintenance request have always been done same day or next day at the latest. I have lived here almost 2 years and I have had no problems at all. Parking spots can be tricky at times though. Not cheap...but worth itsubmitted by Joanne H. - Aug 01, 2015 |Recommended: YesI moved to Temple from Killeen to be closer to work BSW . I wanted to live in a nice complex that was not too large, beautiful, quiet, and safe. I feel Chappell Hill meets my criteria. Of course it does not come without a nice size rent. I will say. The rent is consistent. I live in the largest 1 bd which is 710 non-ungraded. With water my rent still stays below 740. Nice and quiet submitted by Glenda G. - Jun 23, 2015 |Recommended: YesIt is one of the best apartment communities in this area. It's nice, quiet, clean and in a central location. It is beautiful, all the trees and landscaping, but could use some upgrades inside. submitted by Brianna J. - Jun 02, 2015 |Recommended: YesWe loved all the trees and the area. Didn't enjoy the kitchen, and wish there were ceiling fans and lights on the ceilings. Lovely buildings and landscape. submitted by Ashley M. - May 26, 2015 |Recommended: YesI feel safe and at home living here. It is a great place to live.submitted by Antoniette C. - Jan 31, 2014 |Recommended: YesI love living here. It is the best apartment complex in Temple. The staff are wonderful the apartments are well maintained any problems are fixed right away. My only problem would be parking when I get home from work at 6 or 7 I rarely find parking in front of my building .I am single and have one car my neighbors have two people living in a one bedroom apt. therefore have two cars and have lots of visitors taking up the parking spots. I don't think this is right . I think there should be parking for visitors and I think there should be assigned parking 1 spot for one bedroom and two spots for two bedroom and a special area for visitors. For what I pay for rent I should be able to park in front of my apartment and not all the way up the hill. Always very good customer service. Responsive to requests and needs.submitted by Brian G. - Dec 02, 2013 |Recommended: YesYes, I recommend it. 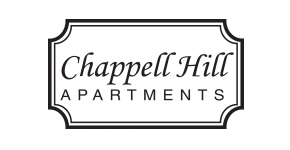 Professional staff and clean, safe, quiet, affordable livingsubmitted by Jordan L. - Sep 03, 2013 |Recommended: YesChappell Hill Apartments is a quiet, clean, well maintained apartment complex with quick, easy access to Scott and White. This is a perfect location for medical students and there are a great many of us who live here. Clean, Quiet, Friendly, and Caringsubmitted by Hailin C. - Jul 01, 2013 |Recommended: YesIt is great. I strongly recommend living here. Quiet and comfortablesubmitted by Sarah A. - Jun 01, 2013 |Recommended: YesIt is extremely quiet and close to many shopping areas in Temple. The management has not changed since I've been here 4 years. Maintenance requests are completed in less than 24 hours. There is a 24-hour a day answering service. Great place to come home to after a long day at work.submitted by James S. - May 31, 2013 |Recommended: YesAn apartment complex where management realizes the importance of keeping the buildings well maintained. The landscaping is always beautiful and it is very quiet place to reside. When you report a problem with your apartment , the maintenance crew respond and repair very quiickly. Love the apartment and the community. Don't like that it costs $27 to pay rent using Visasubmitted by Dorothy S. - May 01, 2013 |Recommended: YesYou will be happy here! Quiet, safe, friendlysubmitted by Sarah A. - Feb 28, 2013 |Recommended: YesIts very quiet. There is plenty of parking. The management has not changed hands once since I've lived here (3+ years). Maintenance responds within 24 hours to all requests. The leasing office is very accommodating.